I was just flipping through the new Annual Catalog when this bright and fun image caught my eye! 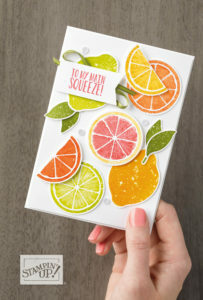 It’s on page 117 of the catalog, and it features the Lemon Zest stamp set, along with some bright and sunny colors…perfect for summer! I do not actually have this set (yet), but I figured I would share this image anyway! 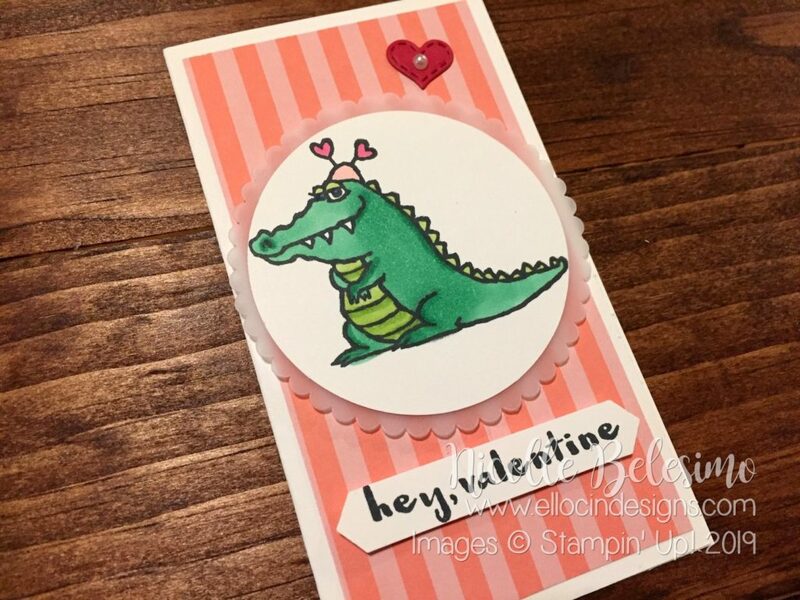 As far as colors go, I am going to have to give it my best guess, as I did not make this card myself! So my best guess for colors are Lemon Lime Twist, Old Olive, Pumpkin Pie, Daffodil Delight, Crushed Curry, Calypso Coral, Poppy Parade, and possibly Melon Mambo? And of course, they are all set against a background of Whisper White! I really just love the fun vibe of this card! I will definitely be putting this on my wish list ASAP, especially with summer right around the corner! Three Shades of Green for Our March Team Facebook Hop! Each month, a number of demonstrators from my upline’s team (myself included) participate in a team Facebook hop. Each month has a theme, and we all create projects based on that theme. We then each link to a different person on the list, and you go page to page using the links to see everyone’s projects! Once you get back to the person you started with, the hop is complete! 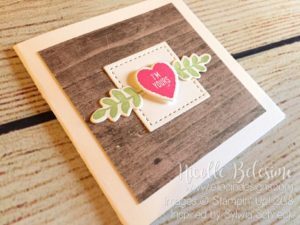 Facebook and blog hops are a great way to see lots of different projects, and get lots of ideas and inspiration! If you are visiting my blog from the Facebook hop for March, WELCOME! I hope you will check back again soon! 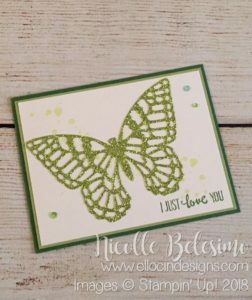 Note: in order to make the butterfly fit on the card and leave room for the sentiment, I trimmed the little tails from the bottom of the wings. 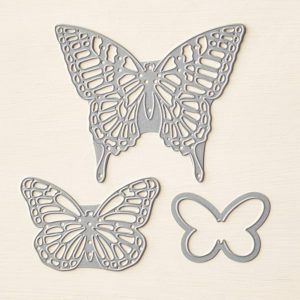 The glimmer paper that the butterfly is cut from may be a fourth green, OR it may coordinate with Lemon Lime Twist…it’s just listed as “light green” in the description of the paper, so I am not 100% sure which green it is supposed to be! I think it looks like Lemon Lime Twist though, so we’ll go with that! 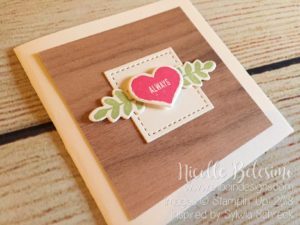 The base of this card is Garden Green, with a Pear Pizzazz middle layer. 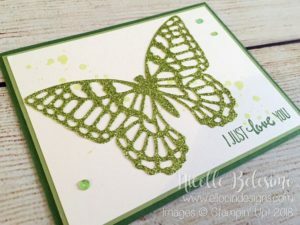 The butterfly is cut from the green glimmer paper using the Big Shot, with a Multipurpose Adhesive Sheet on the back to make adhering the butterfly easy and mess free! Also, I stamped some ink spots/blotches on the background using a stamp from the Swirly Bird stamp set using Lemon Lime Twist ink. 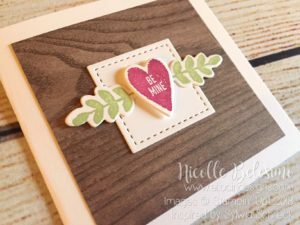 The sentiment is stamped in Garden Green to match the base. 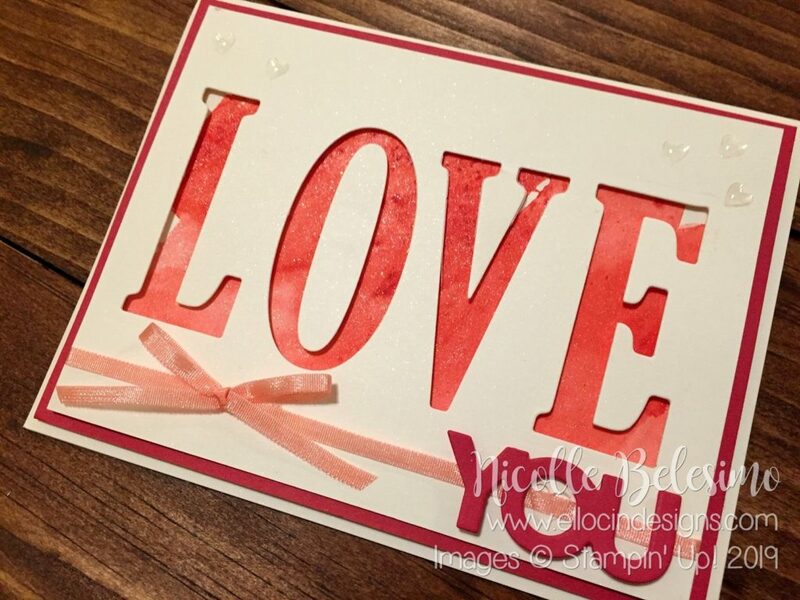 The card is also embellished with a few iridescent sequins, to give it a little extra sparkle and shine! 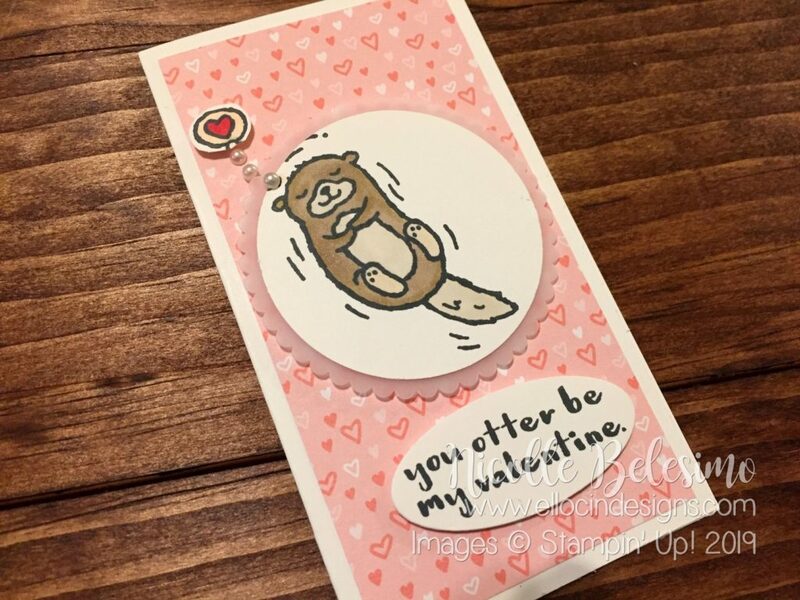 If you would like to see the rest of the projects on the hop, please visit my Facebook page starting at 8:00 PM EST on March 7th, find the post for this card, and then click through the links until you get back to my page! (I would love it if you liked my page while you’re there as well!) Please note that the projects will NOT be posted on Facebook until 8:00 PM on the 7th! Please click HERE to visit my Facebook page! Thanks so much for visiting today! I hope you’ve enjoyed my project! If you have any questions, please feel free to contact me! In yesterday’s post, I mentioned that I made a point to use Annual Catalog products in everything I created this weekend. 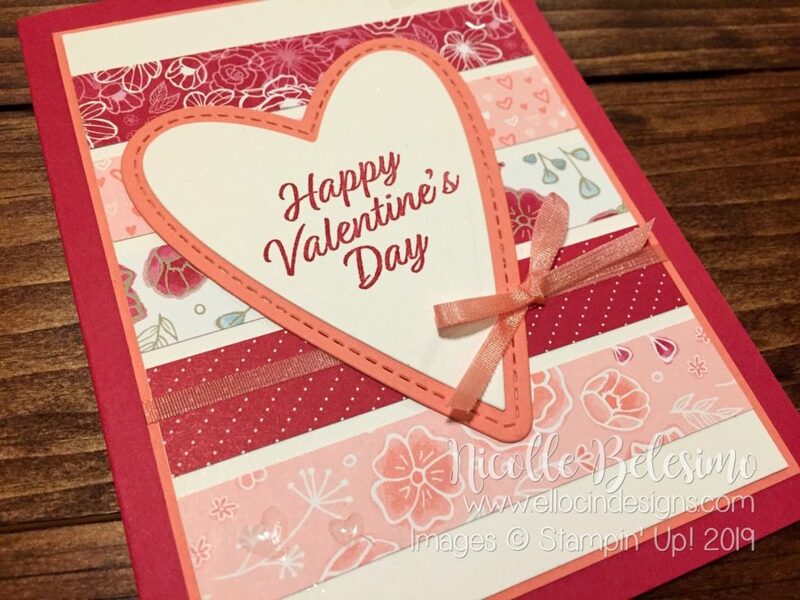 This card uses mostly Annual Catalog items, with only the little “YOU” stamp in the corner being from the Occasions Catalog! 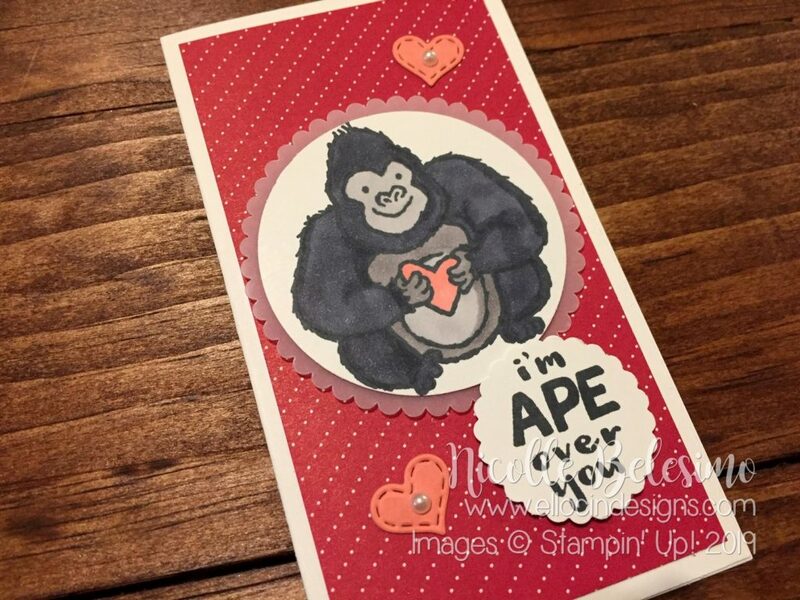 This card was based on one I saw on Pinterest. 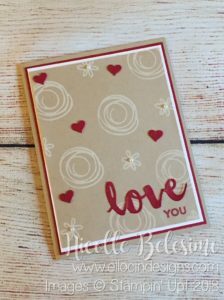 I often look at Pinterest for inspiration, and I’ll look at cards that people have made with other companies’ products and wonder “How can I make that with Stampin’ Up?” So for this card, I started by using White Craft ink on Crumb Cake cardstock to stamp the swirls and small flowers on the background. 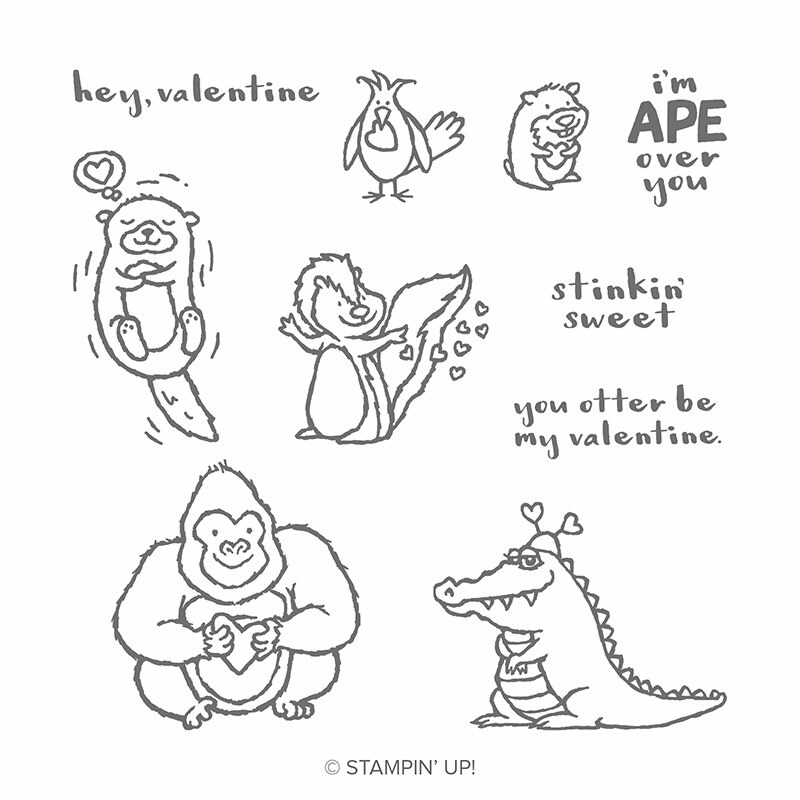 Both stamps are from the Swirly Bird stamp set. 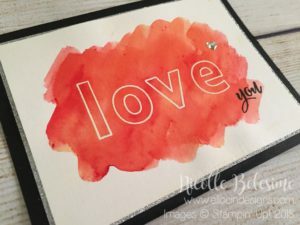 While the ink was drying (craft ink takes a bit of time to dry), I cut out the “love” sentiment on my Big Shot using the Sunshine Wishes Thinlits. 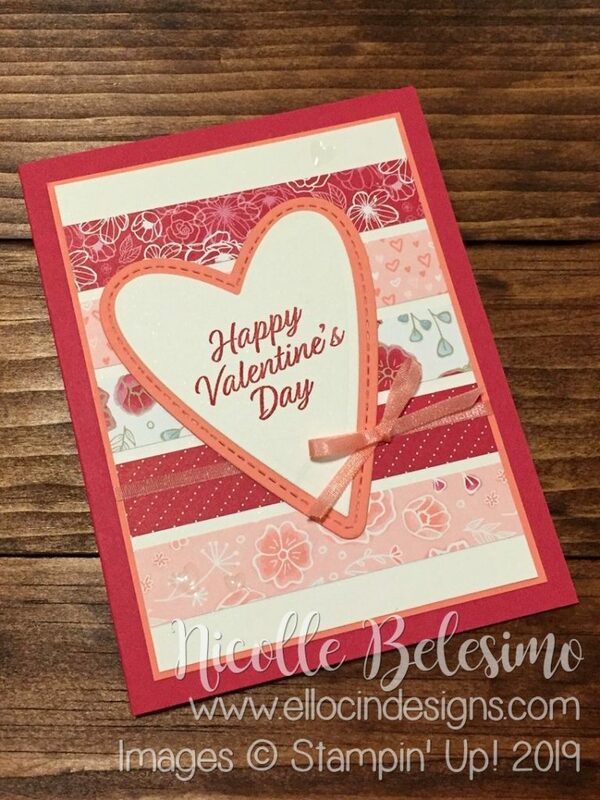 Before doing so, I placed a piece of Multipurpose Adhesive Sheet on the back of the card stock, so that the adhesive would already be on it when I was ready to use it! I also used one of the dies from the Mini Treat Bag Thinlits Dies to cut out all of the hearts. There’s a die in the set that cuts seven hearts at once! Once I had everything cut and the ink was dry, I assembled the card. 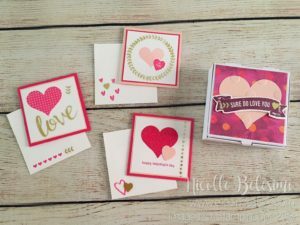 Once all of the layers were adhered with Snail Adhesive, I applied the love die cut, as well as the hearts. (I used Mini Glue Dots on those!) 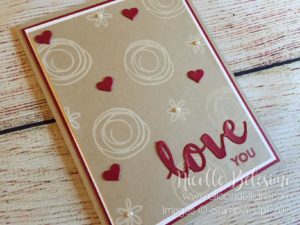 I applied some pearls to the centers of the flowers, and stamped the “YOU” in Cherry Cobbler ink to match the color of the “love”. Once that was done, the card was complete! 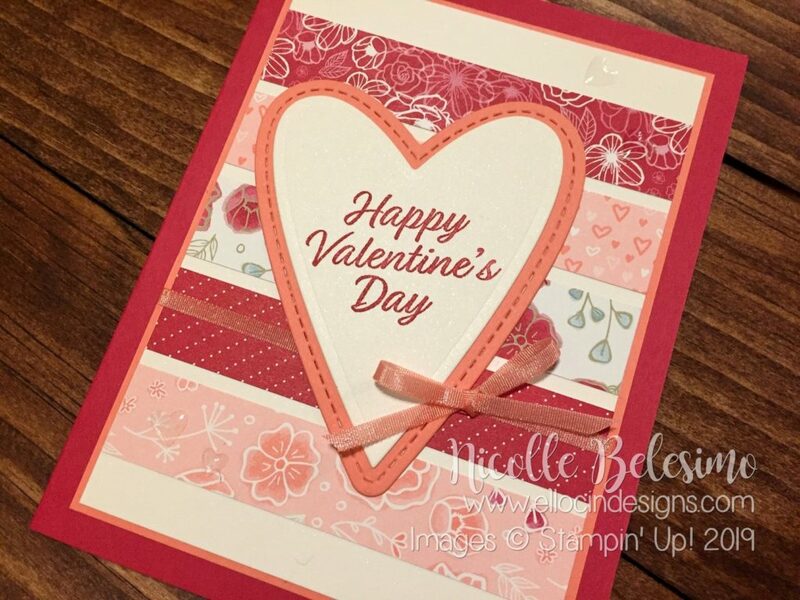 For this card, I chose to use Cherry Cobbler for the red instead of Real Red. 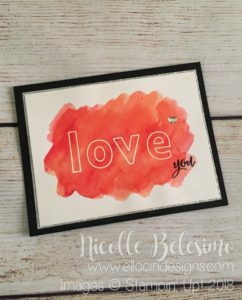 I have used Real Red on most of my Valentine’s Day projects, but for this, I wanted to switch it up a bit! I love the way the deeper, darker red looks against the Crumb Cake background! I hope you like today’s project! Thanks for stopping by! 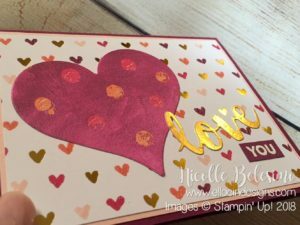 Today’s card combines products from the new Painted with Love Suite with one of my favorite products from the Annual Catalog: the Sunshine Wishes Thinlits! 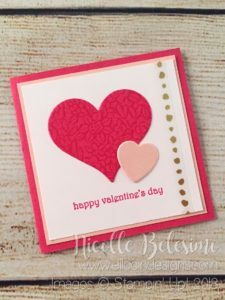 The card base is Rich Razzleberry, the middle layer is Powder Pink, and the top is a design from the Painted with Love Specialty Designer Paper. 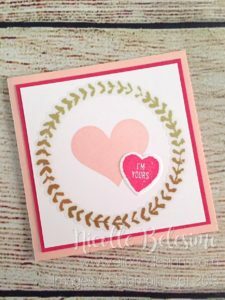 I love this paper because it combines such beautiful colors with gold accents. And normally, I’m not big on gold. I’m more of a silver girl! But with these colors, I think the gold looks amazing! 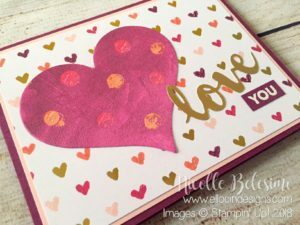 The heart is cut with the Sweet & Sassy Framelits from another design from the same paper. 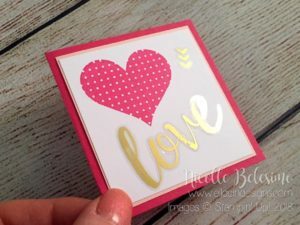 I then cut the “love” sentiment from the Sunshine Thinlits in goil foil, to complement the gold accents in the paper. I also used the Multipurpose Adhesive Sheets on the back of the foil before cutting, to make adhering it easier! 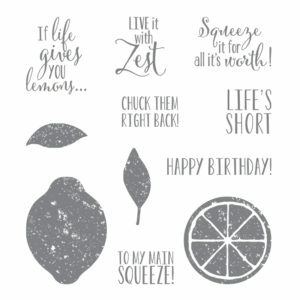 The sheets turn any die cut into a sticker that you just peel the backing off and apply to your project when ready. It’s so much easier and less messy than glue! (No matter how careful I am, I always make a mess with glue!) 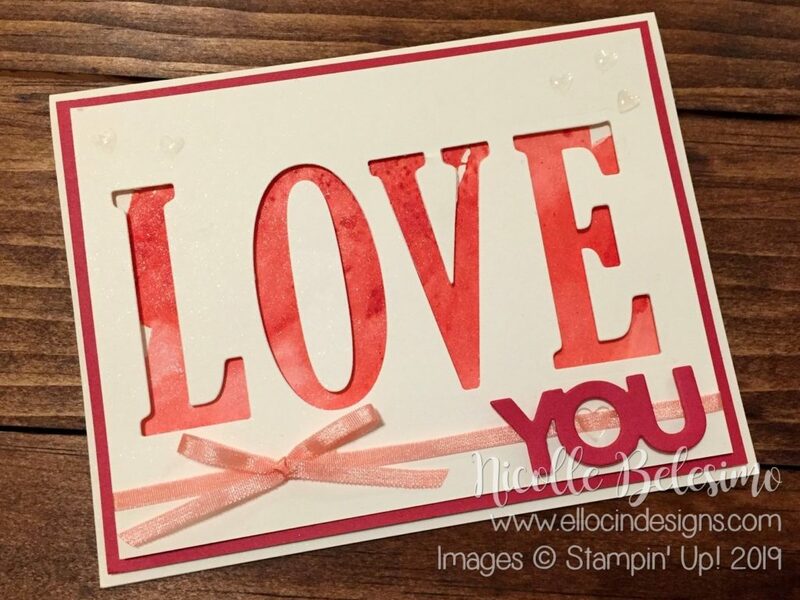 The “you” sentiment was heat embossed in white embossing powder, and comes from the Amazing You set, which can be earned for FREE with a $50 purchase (before tax and shipping) during Sale-a-Bration! In this pic, I tried to get a good shot of the light reflecting off of the gold. Unfortunately, the lighting in my house was not great the day I took these, but hopefully you can see the shine on the sentiment and the little hearts on the paper! 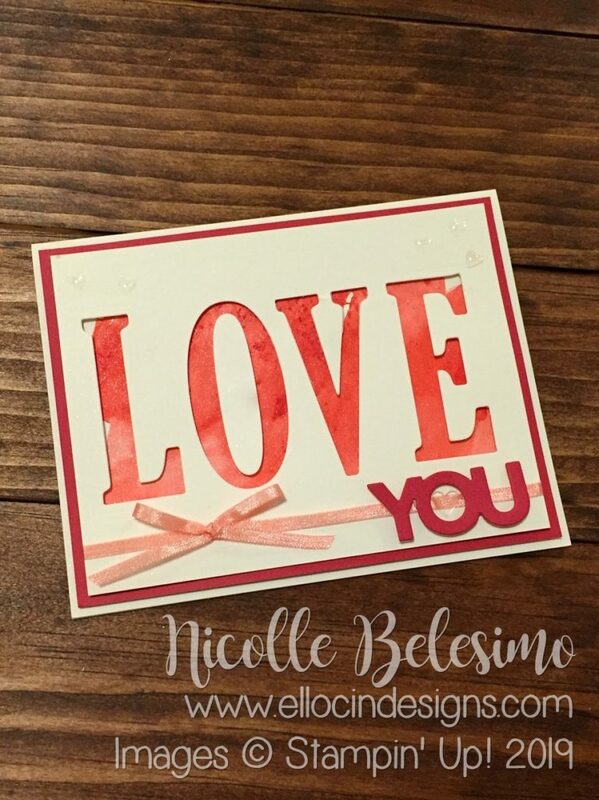 This is a simple, yet elegant card to make for someone you love or for Valentine’s Day (which is right around the corner!) I had originally planned to embellish it more, but then I decided that I liked it just the way it is! Hope you like it! If you have any questions, please feel free to contact me! 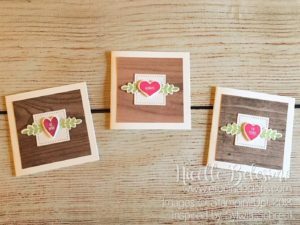 Each month my team does a Facebook hop, which is similar to a blog hop in that a bunch of us post projects on our Facebook pages and then we each post a link to the next person’s page. You click on each link as you go page to page until you get back to where you started. When you get back to the post you started on, the hop is complete! 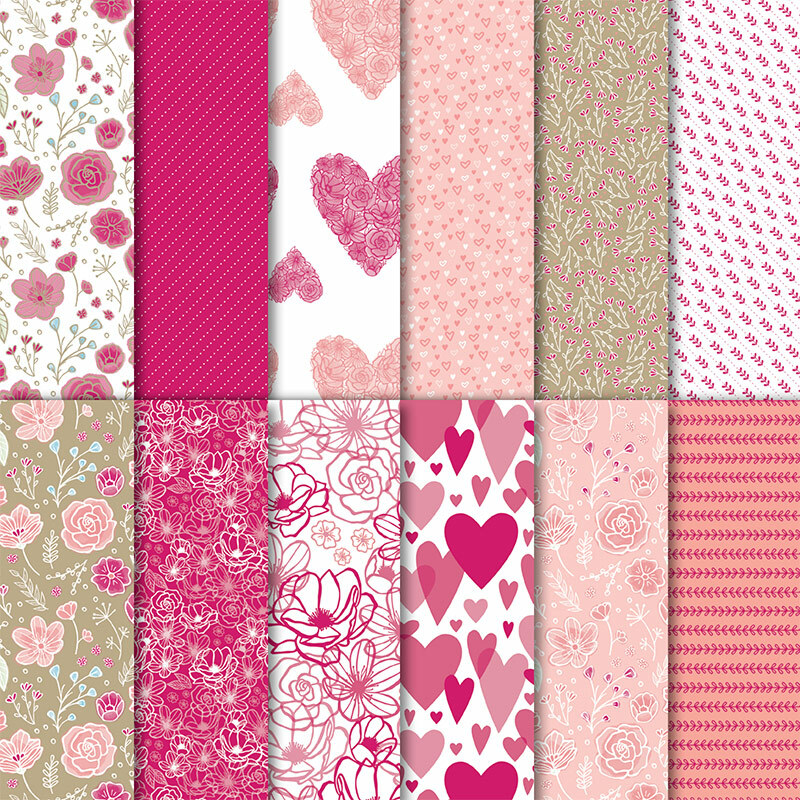 Our Facebook hops usually have a theme, and this month’s theme is Valentine’s Day, Hearts, and Love! 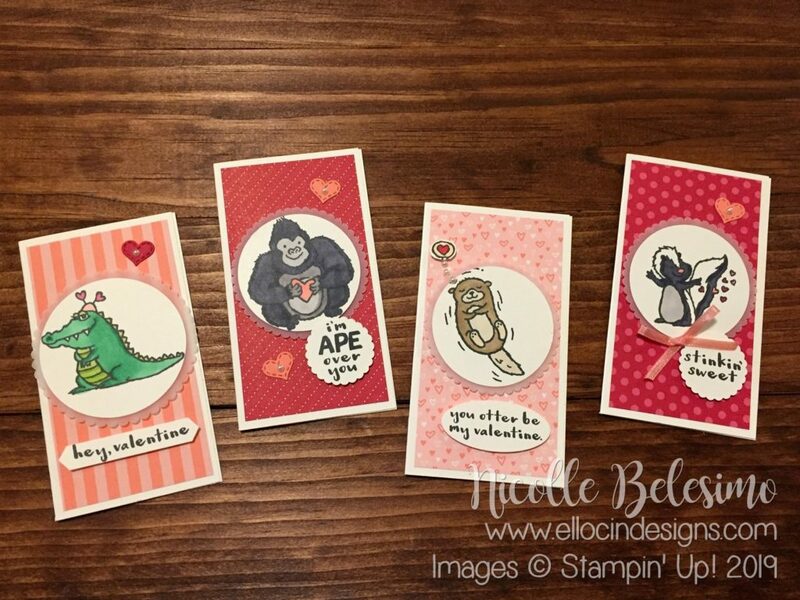 I LOVE mini note cards for Valentine’s Day! I made this set of three mini cards with matching envelopes, along with a decorated mini pizza box to hold them all. The mini pizza boxes are the perfect size for 3 x 3 note cards and their envelopes, and you can fit quite of few of them in there! For this project I only made three, but I plan to add a few wrapped chocolate hearts to the box as well. The box is plenty deep enough to hold all three cards and envelopes, as well as the chocolate! I have to admit that I was a little wary of using the gold stickers, as I am definitely more of a SILVER girl! I was hesitant to even buy them as I VERY rarely use gold on projects. (Trust me, I have a huge pile of unused gold Metallics Enamel Shapes, because I go through the silver ones like crazy!) But I have to admit, after using these stickers on this project, I really love them! Just as a side note, there is a tiny error in the catalog for this item. They are on page 19, and in the product description, it says you get one sheet each of two designs, but you actually get TWO sheets of each! Just something to keep in mind if you see them while browsing the catalog! 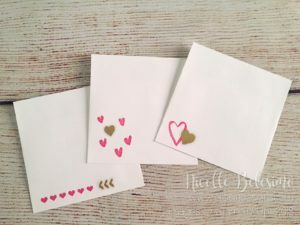 The stickers are all gold foil on clear vinyl, are die cut, and have a large variety of designs such as hearts, brush strokes, leaves, polka dots, and more! They are the perfect way to add a bit of shine to your projects! 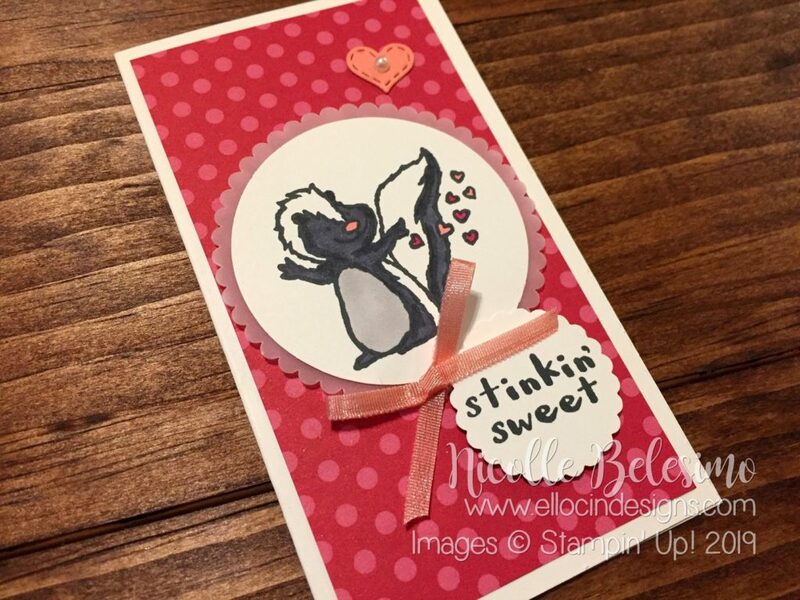 As for the box, I used the new Painted With Love Specialty Designer Series Paper for the background. It is cut to 3-1/4 x 3-1/4 inches. 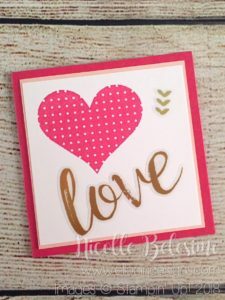 I then cut and embossed a Powder Pink heart using the Sweet and Sassy Framelits and Polka Dot Basics Textured Impressions Embossing Folder. 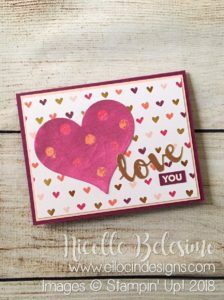 The sentiment and banner piece are both from the Sure Do Love You Bundle, which includes both the stamps and cutting dies. And of course purchasing both items together saves you 10% off the cost of purchasing them separately! This project was fairly quick and easy to make, as the designs are clean and simple. I hope you like it! If this is your first time visiting my Facebook page and/or blog, I would love it if you liked and followed my page! 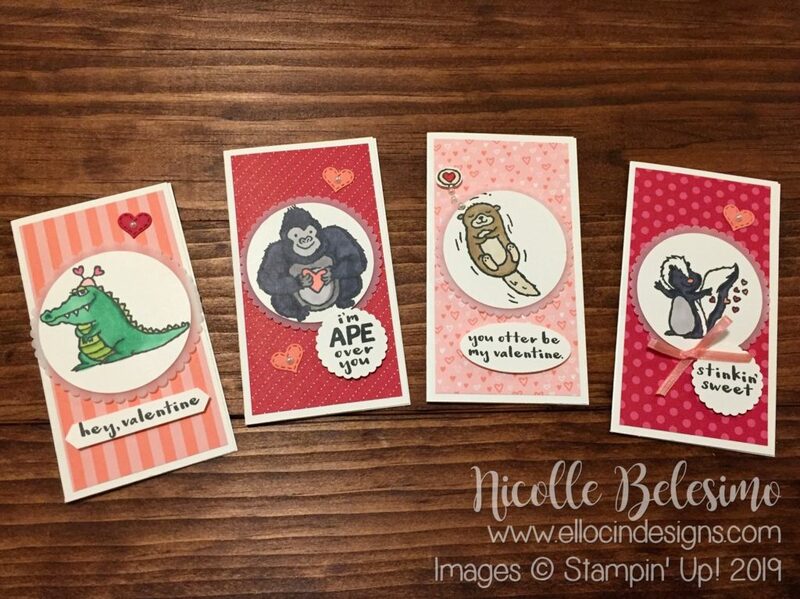 If you have any questions regarding this project, any other projects on my page, or questions about Stampin’ Up!, please feel free to contact me anytime! I would be happy to help you with anything you need!